I found this item at a Chinese supermarket. 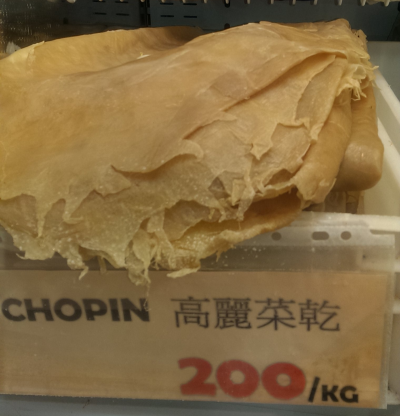 I googled for "Chopin", "Chopin food", "Chopin Chinese", etc. to no avail. Too many music related hits returned! 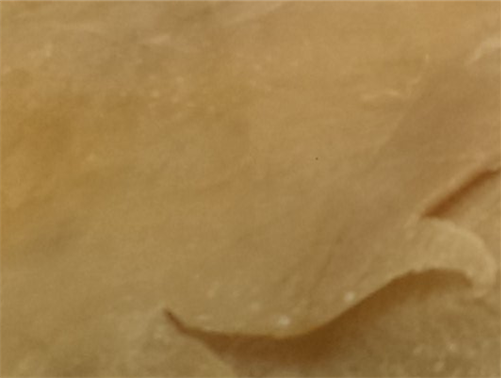 Those appear to be bean curd sheets (ie. 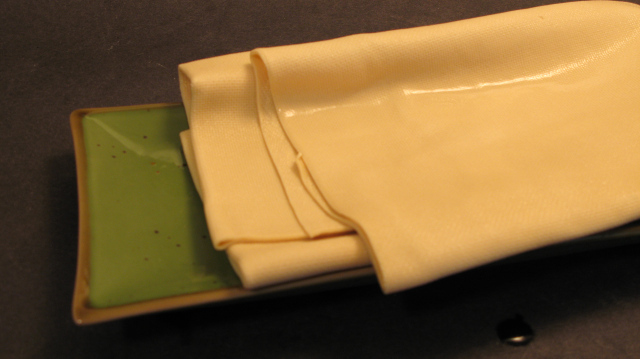 tofu sheets). They're a common find in Asian shops. The OP picture looks like it's somewhere in between; maybe hasn't been cared for too well. It looks like it should look like the first photo but has been left uncovered and has dried around the edges. I think the cabbage label is just a simple mistake/misplacement. 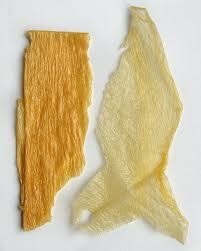 Dried or cured cabbage would still have a visible cellulose structure while the OP picture has a consistent look (if not tofu, then it's certainly something reformed from something like flour or meal - seitan as mentioned in a comment is a likely runner-up). "高麗" is the ancient name of Korea. However, "高麗菜" (where "菜" means vegetable) has nothing to do with Korea, but just how people call cabbage in Taiwan and Fujian. (It's unclear why people use this phrase.) The making process involve drying the cabbage leaves in the sun, so it's called "乾" (in simplified Chinese "干"), which is the name of the Sky in the Bagua, so the category name of any dried things. According to this blog from Taiwan (it was written in traditional Chinese, but you can see the photos to have some rough impression about how the blogger made the 高麗菜乾 for her/his own family using:), people hang up the cabbages on shelves and dry them in the sun untill the cabbages become dry and soft, then salt it and rub it gently, then wait until it become soft (I guess also more pliable), then put a heavy stone on them to push the remaining moisture out of the leaves, then again hang them and dry in the sun, this time, untill completely dried. Now you can seal them in containers and keep them in fridges.